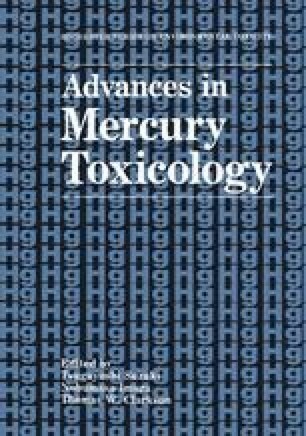 In the population, there is uptake of mercury (Hg) as inorganic (mainly elemental Hg vapor, Hgo), and organic (mainly methyl-Hg, MeHg)Hg. We have monitored biologically the uptake of inorganic Hg through measurements of the Hg level in urine (U-Hg) and of MeHg through the Hg level in blood (B-Hg). Hg exposure may occur from occupational and non-occupational sources. The most prevalent occupational exposure is to Hgo among dental personnel. However, with use of adequate methods, the exposure is low. Thus, in a recent study of 244 dentists and dental nurses, we found that the average U-Hg was only 3.3 μg/g creatinine (range up to 23), which was only slightly higher than the level found in a reference population, 2.0 μg/g crea (up to 10). Considerably higher occupational exposure to Hgo occurs in workers in chloralkali plants and fluorescent-tube factories. Such workers had U-Hg levels up to 78 μg/g crea. In the general population, without occupational Hg exposure, the main source of exposure to Hgo is usually dental amalgam. In a recent study of 81 subjects, we found that there was a pronounced, and exponential, increase of U-Hg with a rising number of amalgam fillings. In subjects with no fillings, the level corresponded to less than 0.5 μg/g crea, in those with many fillings to 5 μg/g crea. Also, removal of all fillings resulted in a dramatic decrease of U-Hg; after one year, the level was only about 25% of that before removal. In Sweden, the main source of exposure of MeHg is fish. All fish contain MeHg. However, the levels are particularly high in fish from lakes, rivers, and coastal waters contaminated with Hg. We have recently studied the association between fish intake and Hg exposure in a population of 396 subjects. In subjects who never had fish, the average B-Hg was 1.8 ng/g, in those who had at least two fish meals per week 6.7 ng/g. The importance of fish was also clearly demonstrated by a close association between levels of marine n-3 polyunsaturated fatty acids in serum and B-Hgs. The situation will deteriorate, as acid rain increases the fish MeHg level.